Here's one of the cards we made at stamp club on Tuesday. It uses the Delicate Dots Designer Series paper pack (one of the Sale-A-Bration items available through this month), Polka Dot Punches and Congrats stamp sets (another couple Sale-A-Bration item) and a piece of Certainly Celery poly-twill ribbon (again a Sale-A-Bration item). Of course, it also uses the Scallop Circle punch and a Pewter Jumbo eyelet to finish it all off. To make this card (or another one using Double-sided paper), cut your paper to 4" x 11". Score along the 11" side at 1-1/4" and 5-1/2". Punch the corners using a corner-rounder punch. Fold the paper in half and fold the 1-1/4 flap down. Wrap the ribbon around the entire piece (to keep the pocket closed) and adhere with adhesive. Stamp the scallop image onto Whisper White card stock and punch out using the Scallop Circle punch. 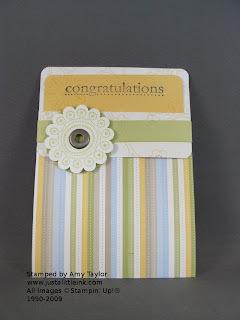 Punch a scallop circle from Certainy Celery card stock too. Using a Crop-a-Dile tool, set the jumbo eyelet onto the Whisper White scallop. Off-set the placement of the two scallops using Stampin' Dimensionals, and then adhere the scallops over the ribbon with adhesive. The insert piece is cut from So Saffron card stock cut to 3-3/4" x 5-1/4". Corner round the top edges. Stamp the flower image from Polka Dot Punches with So Saffron ink randomly on one side. Stamp Congratulations on the top in Basic Black ink and the "on the birth of your beautiful baby!" image just a little lower. That's it! This idea works great for many different cards.